within key government agencies in Papua New Guinea. and justice, infrastructure and agricultural projects in the logging areas of PNG. expenditure from the Levy trust fund. Guinea Customs Service (PNGCS) which deposits the funds into a withholding trust account. accountability, and the minimum that should be maintained. the program and also the relevance and effectiveness of program objectives. unnecessary duplication of effort and could be contributing to the discrepancies. when compared to the volume of logs exported. projects and the funding capacity needed to support them. funding provided under DSIP or Function Grants. Committee has been ineffective, due to inadequate administrative practices. compliance with funding conditions and project implementation. audit and the department’s responses. as it duplicates the functions of the LEDL Trust Account instrument. control of disbursement of LEDL funds. Governing Legislation and the LEDL Administration Guidelines. Development Levy and the institutional arrangements. forest research, forest training and education, and forest organisation and administration. forestry industry, including the Log Development Levy. be imposed and provides for its collection. paying the levy into the LEDL trust account. relevant local level Government or Provincial Government. 1.7 The LEDL Committee members act as trustees of the LEDL trust fund. Customs Service (PNGCS) under the Customs Act 1950 and the Customs and Tariff Act 1990.
be lodged at the Customs Office. Withholding Trust Account which holds the LEDL collections paid by the Log Exporters. is responsible for the collection of the LEDL at its various ports in the country. Finance remains one of the members of the LEDL Committee. transfer the collections to LEDL Trust Accounts. be followed for project proposal, approval and procurement. and responsibilities of the parties involved in these processes. secretariat services to the Committee. as practicable, to avoid misunderstandings in the management of LEDL projects. responsible for the approval of expenditure from the trust fund. including logs and sawn timber. way of tangible and durable development was achieved in the logging localities. the State for commercial logging. • The monitoring, evaluation and reporting arrangements. Development Benefit, the Log Export Tax, the Restoration Levy or other Agricultural levies. Services, Department of Finance and the LEDL Trustees. sites and the project sites funded under the LEDL. process, as well as methods of collection and transfer procedures. Forestry Act 1991 and is reflected in the LEDL Trust Instrument. locations, during the years under audit review. infrastructure, prices change over time due to inflation. the levy was introduced in 2006 (using 2006 as the base year). half per cent per annum. the PNGFA Log Export Procedures. PNGCS in several locations throughout the country. send online by the custom broker to confirm against the export documents produced. the LEDL operating Trust Account (also with BSP) through a direct bank transfer. Internal Revenue Commission (IRC) to PNGCS following a demerger of functions. of LEDL collections for the four year period is shown in Appendix 1.
difference of K3.97 million over the period. Ports has contributed to an understatement in the LEDL Collectors Statement. transfers and verification and reporting processes. organisations. The comparison is shown in Table 4 below. 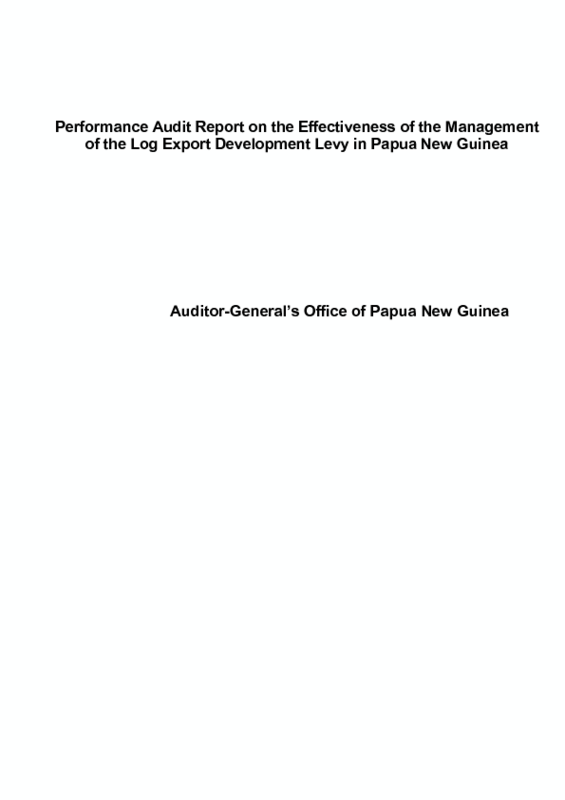 in the PNGCS records compared to the records of SGS Ltd over the audit period. logs exported. Records of the logs exported were from SGS Ltd, a contractor to PNGCS. calculated by SGS and PNGCS (difference in levy amounts is also shown in Table 3 above). of the amount of levy that was due to the trust fund are also shown in Table 4 above. 2 Whole number differences due to rounding. between 2012 and 2015 was not paid into the trust fund due to these weaknesses. expected when compared to the volume of logs exported. funding capacity needed to support them. be reviewed annually, to protect the purchasing power of the levy. makers with accurate and up to date data. primary client – PNG Forest Authority. each other records so there is proper reporting of LEDL revenue to the public. functions of the LEDL Trust Account instrument. and export of logs from a natural forest and from which the LEDL levy has been derived. guidelines and the DSIP Guidelines. and the requirements to qualify for access to these funds. Priority Committee (JPP&BPC) for preliminary screening and evaluation. shown in the flowchart at Appendix 2.
shown in the flowchart at Appendix 3.
recorded and where it is to be recorded. Trustees together with their recommendations for final evaluations and approval. Trustees in 2014. However, the project has yet to be funded at the time of audit in 2015.
non-compliance with the requirements of the LEDL guidelines. from the harvesting of their natural resources. responsibility was transferred to the PNGFA through a 2013 NEC Decision (No 96/2013). issued in July 2013, to reflect the NEC Decision. are being applied for unauthorised purposes. made from the trust account which were inconsistent with the criteria for LEDL funding. Bank of Papua New Guinea (BPNG). this was to fund the Supplementary (Appropriation) Bill passed by the NEC in 2014.
account is not part of the Consolidated Revenue Fund. Morobe Disaster & Emergency Committee in 2012 appears to be not related to a project. to determine the nature or purpose of the payment. payments with insufficient documentation are shown in Table 8 below. Note: 1 Figures Rounded to nearest whole number. management of the trust fund which is not consistent with good administrative practice. Note 1 Figures Rounded to nearest whole number. trust account were not consistent with the requirements of the LEDL trust instrument. controls over the account are working as intended. LEDL trust fund during 2015. Details of the 2015 payments are shown in Table 10 below. which the LEDL has been paid from and the level of funding. was issued in 2009 and this version of the guideline did not provide for this arrangement. the trust account to the District Treasuries in 2015 were made in breach of the guidelines. be additional to existing funding provided under DSIP or Function Grants. stakeholders for proper management and control of disbursement of LEDL funds. throughout the implementation of the projects. the support from Provincial Works Managers. and carry out independent reviews and verify reports from the districts and provinces. monitoring of the LEDL contracts and activities under implementation. and mismanagement of trust funds. PNGFA for CSTB executed projects fulfilling all the terms and conditions of the contract. and the projects were completed in line with the scope planned and approved. for inclusion in a periodic report by the Treasury on budget outcomes. ascertain whether such reports were submitted to the relevant authority as required. K48.5 million of projects detailed in Table 8 above. not made available to audit to suggest that this requirement was complied with. administrative guidelines for LEDL establishes the monitoring and reporting framework. report compliance with funding conditions and project implementation. and the Use of the Log Export Development Levy. proposal and application for funding is illustrated by flowchart below. Supply and Tenders Board (CSTB).